Dimensions: 4" x 1" x 5" Disclaimer: Ships to.. The Cantinero by Picnic Time is an original design featuring an acacia tray with specific area..
Prost! Das Bier Boot contains two full liters your favorite frothy brew. Grip it by the ankle, raise..
For the Whisky Bar Gift Pairing (p/n 16652) with free gift wrap. Riedel Vinum Whisky Glasse..
Glencairn Whisky Tasting Set (P/N 355 54 31). Champagne, Brandy, Wine... each has its own glass to h..
Glencairn Whisky Tasting Set (P/N 355 54 31). Champagne, Brandy, Wine... each has its own glas.. The Golf Flask by Picnic Time combines a premium stainless steel flask and golf accessories wi..
govino Shatterproof Beer Glass 4-Pk (P/N 5020). Govino™ really means go anywhere you like. Des.. DESCRIPTION Brave the night with this sleek and sophisticated six ounce hip flask. Crafted from h..
Laguiole En Aubrac Buffalo Horn Champagne Saber (P/N CMS99BUI). Crafted by a master cutler, th..
Four 12 ounce glasses feature a wide bowl so that your cognac can breathe. Made of glass Dis.. Contains 15.25 oz. classic pilsner, 20 oz. English pub, 16.5 oz. Belgian ale, 20 oz. craft pub, 14.7..
Indulge in an evening of beer tasting with a little help from this Libbey Craft Brews Beer Flight Se..
Lucca Cafe Goblets & Pitcher (P/N 15593). 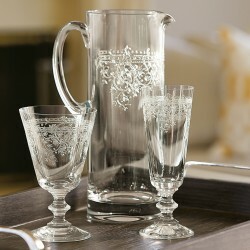 This stunning etched pitcher and goblet set is h..
Lucca Cafe Goblets Set of 6 (P/N 150.02.00). These stunning goblets are lead free and feature ..
Lucca Martini Glasses Set of 6 (P/N 17068). These stunning martini glasses feature a delicately-etch..
Lucca Stemmed Pilsner Set of 6 (P/N 17070). These stunning stemmed beer glasses feature a deli..
Lucca Wheat Beer Set of 6 (P/N 17069). These stunning wheat beer glasses are hand-made and fea..
Orbit Whiskey Decanter & Stopper (P/N 17332). The orbit shape of this contemporary decante.. Port Sippers, what a lovely way to spend an evening. Dating back to 17th century Europe, the port si..